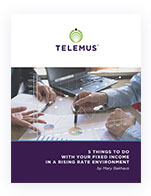 Telemus is a place where financial security is just the starting point. A place where you can identify and realize a more profound, more aspirational mission – to leverage your wealth to help you achieve your envisioned future. Through a deep and thoughtful exploration process with a unique team of experts, we help you define what financial and personal achievement means. By igniting a partnership with Telemus, we will help you attain personal life enrichment, your grandest visions, and your life’s most important goals. At Telemus, we have a different perspective on your financial life. When you take a seat at the Telemus Roundtable, you gain access to the most compelling conversations and inspired solutions for your financial future. We offer you a brand new, more holistic outlook far beyond just investment management which we know will serve as the inspiration for a more enriched life.